French duo 2Kilos &More was formed in 2003 by Séverine Krouch and Hughes Villette, but their first release, a mini album entitled 9,21, wasn’t published until three years later on artisanal Paris-based imprint Taâlem. This was followed a year later by a full length album, 8Floors Lower, on Jeans Records, with a second album, Entre3villes, on Optical Sound issued two years later. Krouch and Villette also joined the ranks of French performance art collective Von Magnet, famed for mixing electronic music with flamenco and oriental music, in 2008, and with whom they have performed regularly ever since. Returning to their project, the pair have teamed up with German imprint Audiophobe for their third opus. 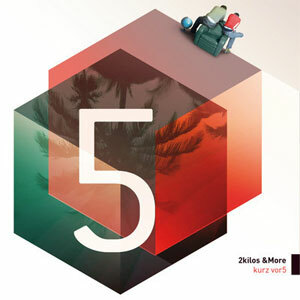 Brash, caustic and unsettling, Kurz Vor5 is a particularly intense, complex and somewhat psychotic dystopian affair which encompasses in its course ill ambient moments, dark post industrial sections, noise, hypnotic grooves and twisted poetry. While the duo rely partially on electronic sounds and processing, their extensive use of live instrumentation (electric guitars and drums), give their work a resolutely intense and visceral aspect. The album opens with fluttering electronics and light percussive fragments, which are soon replaced by a more clinical linear rhythmic pattern over which slowly build melodic loops and sombre soundscapes. In its second half, On The Juiciest Walk takes on a darker shade of metallic grey as the pair continue to add layer after layer of sound, finally reaching full capacity when processed saturated guitars are added. But, instead of hitting excruciating levels, the piece collapses upon itself totally unexpectedly, leading into Les Rapports S’Inverse, initially a fairly subtle piece which eventually crashes through a hefty wall of noise. Later on, One In The Other follows a similar path, starting from a mechanical loop which, for the first half of the piece, remains pretty much unchallenged, but which becomes subjected to increasingly intense assault of noise and distortion until it is ultimately overwhelmed. Although this album is, for the most part instrumental, the duo have called upon the vocal services of Phil Von, one of Von Magnet’s original members, who delivers a stark performance on Infinite Dead Ends, and Paris-based Scottish poet Black Sifichi, who has previously recorded with The Black Dog, Burnt Friedman or Strings Of Consciousness, who contributes to User OK Feelings Rejected and I Decided To Lie. In typical Sifichi style, his texts are in turn disturbing, haunting or incendiary, and his delivery is equally as prodding, his voice, although unmistakable, taking on an argumentative hue on User OK Feelings Rejected as the music becomes more intense, and a more restrained tone on I Decided To Lie, for which Krouch and Villette concoct , once again, a slow burning soundtrack which switches from a fairly gentle opening section to a much rawer second part, Sifichi’s voice eventually fighting against torrents of electricity until he summons the whole thing to stop. Occasionally, Krouch and Villette pull back and opt instead for more subtle pieces. Allerdings is built around sturdy blocs of electronic textures which, although imposing, never disintegrate into chaotic formations. Equally, What Holds Me Here is centred around brooding sections for its duration, but although underlying tension can be felt pretty much throughout, it remains under tight control. The only purely atmospheric moment on this album is to be found on closing piece Second Season, which appears at first to want to develop into a surprisingly pastoral piece before being entirely stripped back, leaving just a rhythmic pattern and a few splashes of guitar to bring the curtain down on a particularly strong and haunting record.